Alexandra Bannerman, Product Marketing Manager, explains how the Criteo Engine drives the best value from your advertising budget. 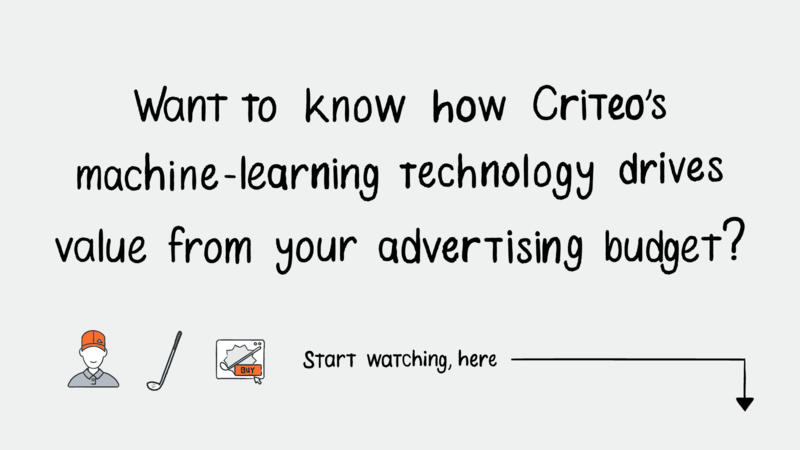 The Criteo Engine relies on cutting-edge machine learning technology, utilizing the world’s largest open shopper data set, to drive optimization in ways manual campaign management can’t match. A perfect example of this is Predictive Bidding, a feature of the Engine which calculates the right bid at auction for every possible unit of ad inventory that could help you reach your shoppers. How does Predictive Bidding work? Over more than a decade of R&D efforts, Criteo has perfected three core predictive models which utilize granular insights on shoppers, products, publisher inventory, and the interactions between them to tell the Criteo Engine three important things: which shoppers are likely to engage with an ad, which are most likely to convert, and how much each shopper is likely to spend. These complex variables come together in real-time to provide a valuation for each and every opportunity the Engine has to show an ad to a shopper. We call this valuation eCPM. Why do we use the term ‘eCPM’? Well, standard CPM, or ‘Cost per mille’, is defined as the ‘cost per thousand views of an ad’, which is the standard pricing model for ad units in publisher inventory auctions. However, when used for retargeting, this business model means you pay for ad views which may not reach the right shoppers and don’t necessarily translate to engagement or conversion. To more closely align with your goals, the Criteo Engine predicts shopper engagement and conversion behavior to determine the impression’s value to you, and translates this into a bid amount that can be made in a CPM auction (a.k.a. eCPM). Let’s examine the controllable variables in the eCPM formula, which are supplied by you, the advertiser. Cost-Per-Click (CPC), Cost-Of-Sale (COS) and Cost-Per-Order (CPO) are all inputs you can provide, depending on how you want to manage your campaign. A bid for inventory would depend on what you’re willing to pay for shopper engagement – the higher the CPC, COS or CPO, the more inventory and shoppers you can reach. Now let’s take a look at the predictive variables in the eCPM formula, which are calculated by the Criteo Engine. The predicted Click-Through Rate (pCTR) is how the Criteo Engine measures the likelihood of shopper engagement, in line with the click-based sales attribution systems most advertisers use. The predicted Conversion Rate (pCR) also plays a part in how much the Criteo Engine can bid for inventory; the higher the likelihood the shopper will convert, the higher the bid can be. The predicted Average Order Value (pAOV) allows the Engine to raise your Return On Ad Spend by driving more ads to shoppers likely to have a higher basket value. We also use additional parameters which adjust the eCPM for budget constraints (Ω), media purchasing channels (ß), and auction dynamics (µ). So, what does the eCPM formula really mean? Essentially, eCPM tells the Criteo Engine’s Predictive Bidding technology how much a specific ad impression will be worth to you, the advertiser. For instance, showing a particular shopper a specific ad in a specific context is expected to generate $x amount of money, and is therefore worth a bid of $y at inventory auction (x and y being variables determined for each individual impression). This is how the Criteo Engine spends intelligently to get the best from your budget. Calculating each of the predictive variables, and the final eCPM value, is very complex and beyond the scope of this article – but to make it easy to understand, let’s bring it to life with a simplified example. Three shoppers who have all previously browsed your website are now individually browsing a publisher website. The Criteo Engine is about to bid for ad inventory, having determined that it would be valuable to display your campaign to these shoppers. When setting your campaign up, you’ve decided on a Cost-Per-Click of one dollar. Predictive Bidding uses its predictive models and data on the shoppers, context, and inventory available to determine each shopper’s chance of engaging (pCTR) and converting (pCR), and their likely order value (pAOV). These figures plug into the formula to provide the eCPM values for each shopper, which shows what bid amount they are worth to you. Remember, this is a very simplified example to demonstrate the concept of eCPM. Real-world situations are considerably more complex, with Predictive Bidding’s machine learning technology using a vast dataset and real-time shopping signals to calculate the formula’s predictive variables and additional parameters. These calculations happen almost instantaneously to reach shoppers in the moment. For each impression, Predictive Bidding takes only 10 microseconds to choose a relevant campaign to show, calculate all variables plus the eCPM value, and place the correct bid at inventory auction! The Criteo Engine targets all shoppers who are valuable to you. In addition, because the Criteo Engine’s Predictive Bidding technology can so accurately predict each shopper’s behavior, it can also prioritize some shoppers over others based on your individual business goals. In this way, the Criteo Engine can align with your goals using a whole range of optimization models to drive revenue, conversions, traffic, or even the amount of margin associated with specific products sold on your site. Predictive Bidding’s powerful optimization models help you maximize ROI by letting you choose the right optimization strategy for each of your campaigns. Long story short, the Criteo Engine uses advanced Predictive Bidding technology to accurately determine the value of shoppers, and ensure your ads target the shoppers who are likely to drive the results you’re looking for. This requires a high level of predictive accuracy which is only possible with the vast and granular dataset Criteo has access to.